El Skippito is back! Avoiding a lecture from Mama Junebug, the kitty boy slips into his closet...and finds himself in ancient Egypt. His doggy pals, Los Chimichangos, want to visit Under Mundothe underworldwhere mummitos rest in peas. But they need El Skippito's brains and courage to answer the riddle of the Finx and enter the mummy's tomb. Our hero is up to the task, and he's in for another grand and whirlwind adventure. 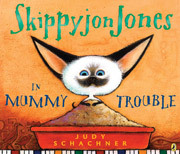 Full of Judy Schachner's rollicking wordplay and bold, imaginative illustrations, Skippy's latest outsized outing will tickle the funny bones and warm the hearts of his many amigos.